Stack'n'Splash is an action puzzle designed to test your sorting skills under pressure. Arrange blocks into groups by swapping, pushing, stacking, dropping, and splashing! Groups of 3 or more blocks are removed from the game and points awarded! Your aim is to push the remaining blocks under the water! All the time, new blocks are raining down from the sky, in a race against the clock! Careful game play will slow the falling blocks, but you'll have to move fast when the levels get more difficult! 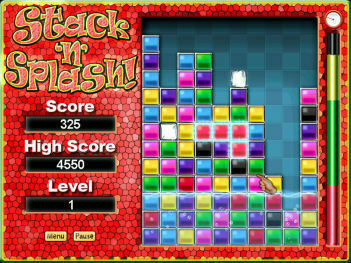 The game takes on elements of Bejeweled and Tetris Attack, and adds more than a splash of originality. Added Clear button for in-game Text Entry. Some graphical/performance improvements. Updated High Score sending. Fixed a passcode entry bug.